Just a quick note, I want to thank you for a fantastic week in March! I could not ask for more, Croatian is beautiful. It was fantastic to see lots of small islands. Kornati are especially stunning. Vacation was wonderful! The weather was great, great food, beautiful beaches, sailing pleasure and adventure. We hope to meet again. Thanks to CharterCroatia.net for all! Our honeymoon was unforgettable. Thanks, not only to beautiful places, but also to the ship, which was in very good condition, clean and pretty equipped. See you again! la ringrazio per il suo interesse, siamo stati molto bene in catamarano e la Croazia c'è piaciuta moltissimo! Lo skipper era molto carino ed estremamente educato e gentile! We had a really great time sailing and did almost 250 nm even though the wind was very light (but lots of sun!). The boat was great and staff at the marina very friendly and helpful - everything went just perfect. Thank you again in helping out with such a short notice! We will come again next year! The memories of the holiday are fantastic. We had an amazing and memorable time in the Adriatic sea and the boat itself was very comfortable and nice. Weather was perfect and I wish the sailing lasted more then a week. Here are some photos. Feel free to publish on your page if you wish. 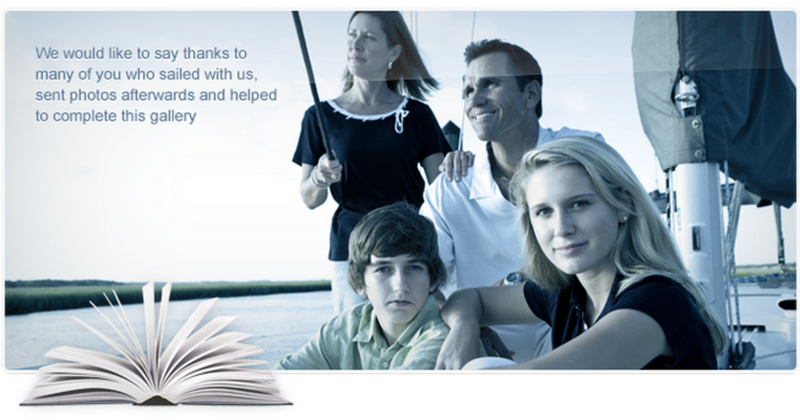 the boat was generally very good to sail and we were very happy with the experience. I want to tell you that our experience on the boat in Croatia was absolutely positive. The ship was exactly what I expected, clean and in good condition. I was afraid that something goes wrong because this is the first time to organize a home through the Internet and through your agency, but this experience has confirmed that you are efficient and reliable. Surely we will return but until then I welcome you warmly. Hi again Ivana, everything was very okay and we are very satisfied :-) We have already decided that we are going to do this again. grazie della Sua cortese mail. Siamo stati molto contenti della Issa(Bavaria 34), del Suo aiuto e di Toni. Una bella vacanza. Se il prossimo anno volessi prendere la Issa da Dubrovnik sarà possibile? O anche da una Marina più a sud di Rodgonica? Siete stati molto bravi e vorremmo ancora lavorare con Voi. E' stato tutto perfetto e ci siamo rilassati moltissimo.Grazie per il vostro impeccabile servizio. Speriamo di cuore di poter ritornare in Croazia nei prossimi anni.In tal caso vi contatteremo sicuramente. Buona estate e grazie ancora di tutto! What a holiday! We met many nice people, visited so many beautiful places and had so many new experiences. Now we have a lot of beautiful memories that we cherish forever. We can not wait until the next opportunity for a vacation with CharterCroatia.net Thank you for the wonderful vacation. Just a quick email to say thank you on my behalf and my friends. We had a great holiday. The boat was really nice and what it's most important we could not wish for a better skipper! He is both a very nice person & professional. Many thanks for your services & I'll leave a very good feedback on the trip adviser. These days many people check this website and you didn't have many reviews so I hope it will be of help/ good advert for you. Many thanks and all the best in the future! ... WOW! John, me and whole team want to tell you that we had an absolutely wonderful time, I will send you some pictures... Sunset that night was fabulous. It makes my whole family and friends jealous when they see so wonderful place! Thank you and goodbye until next year! It was absolutely amazing, the nicest boat we have ever chartered ! Thanks ever so much for getting me such a great deal, as the boat was quite new, it was very good on fuel, which meant we could use it more than usual. We had a great time and will be in touch with you next year, the only problem, I forget my camera! Super smo se proveli i bili smo jako zadovoljni sa brodom, osobljem i sa Vama. Zao mi je da se nismo uspjeli upoznati, ali nadam se drugom prilikom. We want to thank your agency on a fantastic journey. The ship was in perfect condition and seven days, we sailed pleasantly. I will definitely recommend you to friends who are interested to visit Croatia. thank you for your message! As to our sailing we are extremely happy of our week in Croatia. The yacht, Painkiller Beneteau Oceanis 46 is superb, we loved it. Also the service of the Adriatic-sailing was excellent to say the least. Only the weather was not 100 %, the whole week was hot (maybe too much for us nordic people) and some more wind would have been optimal. Anyway summarizing I can tell that we got a wonderful week in Croatian waters and therefore I just can adress huge thanks to everyone there who made it possible! I am sure we'll be back! It was one of the best trips we ever had. CharterCroatia.net is outstanding at all levels. Thank you for such lovely memories!